I’ve come to conclude that there are two types of people in this world – those that love breakfast food, and those that could take or leave it. To this day, I still don’t understand my mom’s ambivalence towards decadent treats like Baked French Toast Casserole with Praline Topping, Brown Sugar-Bacon Buttermilk Waffles, or the world’s Best Buttermilk Pancakes. She does love my scones, though – the Cinnamon-Sugar and Dark Chocolate Chip are her favorites. It goes without saying that I didn’t get my love for all things pancake, waffle, bacon, and sausage from my mom. I could easily eat breakfast food for, well, breakfast, lunch, and dinner. Sometimes there’s nothing better than a fluffy stack of pancakes with breakfast sausage for dinner. Who’s with me?! 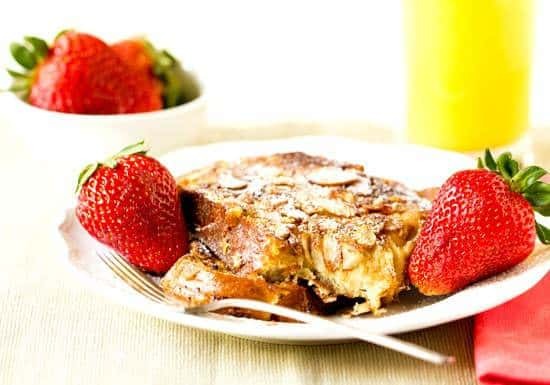 Needless to say, I won’t be whipping up any breakfast-centric meals for my mom on Sunday for Mother’s Day, but thought that you might be, and wanted to share an awesome French toast recipe with you. A little over a year ago when my Chief Culinary Consultant and I were down in Florida visiting his parents, they took us to a popular breakfast spot called John G’s. When we ordered, his parents both got the cinnamon-nut French toast and said it was the best thing on the menu. We apparently didn’t listen closely enough, and went ahead and ordered other things. Breakfast came, and when I was offered a bite of the French toast I didn’t hesitate. I immediately regretted my decision not to get it. We haven’t been back there since, but that French toast dances in and out of my mind every so often. 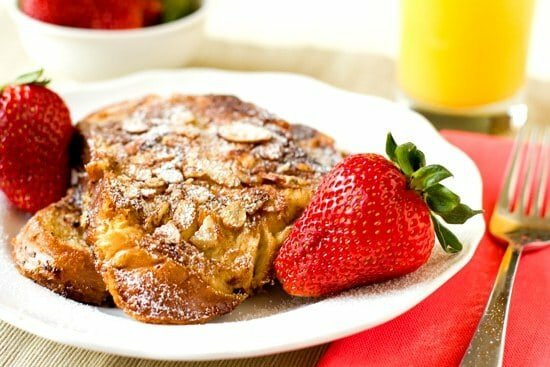 With Mother’s Day coming up, I thought it would be the perfect time to try to recreate that wonderful French toast with an almond and cinnamon-sugar coating. I used a basic Cook’s Illustrated French toast recipe, dressed it up a little, threw on some pearls, and made some adjustments. 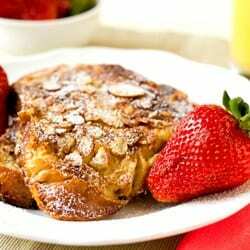 The end result is now my favorite French toast – the bread is crisp on the outside, soft inside, and coated with sliced almonds and the crunch of a cinnamon-sugar layer. It’s just fancy enough to make it something extraordinary, but not the least bit fussy. That’s the perfect recipe for a special, stress-free breakfast! Preheat oven to 300 degrees F. Place the bread on a wire rack set in a rimmed baking dish. Bake bread until almost dry throughout (center should remain slightly moist), about 16 minutes, flipping slices halfway through cooking. Remove bread from rack and let cool for 5 minutes. Return baking sheet with wire rack to oven and reduce temperature to 200 degrees. 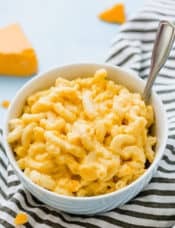 In a medium bowl, whisk together the milk, egg yolks, brown sugar, ½ teaspoon cinnamon, 2 tablespoons melted butter, salt, vanilla extract, Triple Sec, and orange zest until well blended. Stir in the sliced almonds. Transfer the mixture to a 9x13-inch baking dish. In a small bowl, stir together the 4 tablespoons granulated sugar and 2 teaspoons ground cinnamon; set aside. Soak the bread in the milk mixture until saturated but not falling apart, about 20 seconds per side, ensuring that some almonds adhere to the bread. Using a slotted spatula, pick up a bread slice and allow excess milk mixture to drip off; repeat with remaining slices. 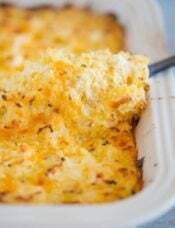 Place soaked bread on another baking sheet or platter. Sprinkle 1 to 2 teaspoons of the cinnamon-sugar topping over one side of each slice of soaked bread. Heat ½ tablespoon unsalted butter in a 12-inch skillet over medium-low heat. 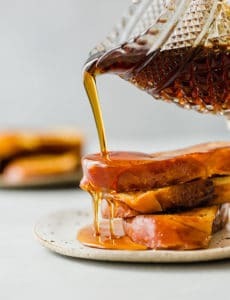 When the foaming subsides, use the slotted spatula to transfer 2 slices of the soaked bread to the skillet, cinnamon-sugar side down first, and cook until golden brown, 3 to 4 minutes. While they cook, sprinkle the top of the bread with 1 to 2 teaspoons of the cinnamon-sugar mixture. Flip and continue to cook until the second side is golden brown, 3 to 4 minutes longer. (If the toast is cooking too quickly, reduce the temperature slightly.) Transfer to the baking sheet in the oven. Repeat cooking with remaining bread, 2 pieces at a time, adding ½ tablespoon butter for each batch. 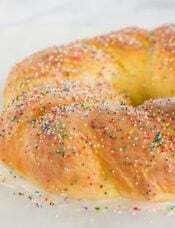 Serve warm, sprinkled with powdered sugar, and/or drizzled with maple syrup. Delicious! I made this french toast this morning for my boyfriend, who is very picky when it comes to food, and he absolutely loved it. I am often searching recipes and many times I end up on your website because it’s wonderful. Anyway, I can’t tell you how excited I was to find that you had experienced the same delicious pancakes with slivered almonds in Florida that my husband and I had years ago while visiting my mother in law in West Palm Beach. We still talk about those pancakes to this day! We could not remember the name but now I know this is it? Beautiful location…beach, the search is over. 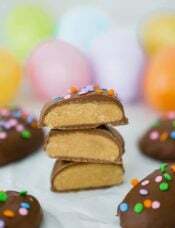 I will definately be making these soon. I made my home made bread this morning, soooooo, sooner than later! mmm I’m always on the hunt for new breakfast (and been in the need for french toast) inspirations. I cannot wait to try this, i never thought to put almonds in it but that extra crunch would be scrumptious! Hi Satu, The 1/2 teaspoon cinnamon in the batter isn’t much, and the cinnamon-sugar topping is meant to be crusted on similar to a snickerdoodle cookie. If you don’t like cinnamon you could certainly cut back on the amount, but I wouldn’t omit it completely. It truly doesn’t get much better than this. I am an in between breakfast person… Some days I want it for every meal, other days I am whatever about it. 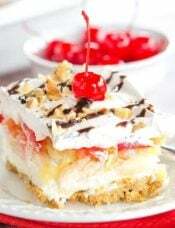 But this looks delish!! 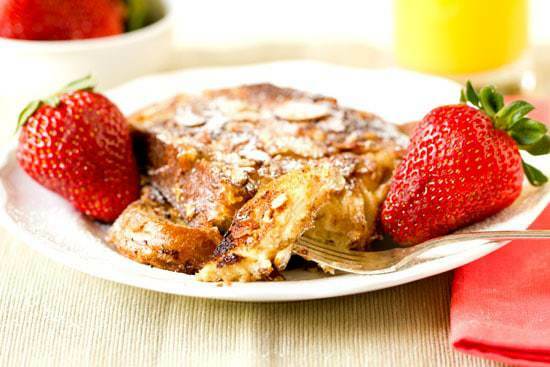 French toast is one of my absolute favorites! 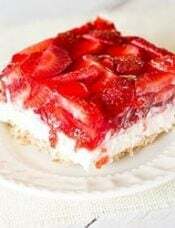 Will someone PLEASE make this for me on Mother’s Day!?! My rule is I don’t cook on Mother’s Day.